If there’s anything a little girl wanted for Christmas in the 1930s, #1 on her list would have been a baby doll or a little girl doll. My grandma still has all the old dolls she had as a kid and let me tell you, those things are unbelievably valuable now. Dolls ranged anywhere from the cheap to the extravagant and the focus was always on the sleepy eyes, the strong composite body and being as lifelike as possible. Some were small — around 9 inches — while others stood a towering 27 inches. But how was a girl to choose? She had too many options! 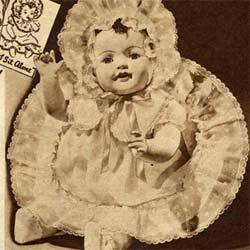 Check out the different types of dolls a girl had to choose from the 1930s catalogs! See How Big I Am? She’s 27 inches tall — almost as tall as the happy girls who played with her. She has gorgeous long curls, beautiful blue eyes and real eyelashes. She sleeps and talks. She wears a green organdy dress with matching green hair ribbon, undergarment, socks and slippers. Strong stuffed body made of composite. Sold for $3.45 in 1933. Beautiful and unbelievably big, sleeping dolls of fine quality materials. More correctly proportioned than the usual low priced dolls even though larger, because better parts are used. Big, wistful, sleeping eyes and long lustrous lashes (except model #49V3016 has no voice). Soft crying voices (except model #49V3017 has no voice). Rosebud mouth; tongue, pearly teeth. New full cut dresses, smartly styled by Anne Williams. jaunty bonnets and undies in matching colors. Sprayed, waterproofed, pink tinted enameled composition head, arms and legs. More life-like features than those found in other dolls! For the first time, a 17-inch composition doll with “furry” plush ensemble. Pretty white soft, cotton plush. Cossack style hat, coat muff and Organdy frock. Undies, cotton socks, imitation leather shoes, dainty mouth, teeth, tongue, sleeping eyes, long lashes, turning, tilting head, long slim legs and inside jointed arms. Model # 49V3017 Sold for 95 cents in 1937. At 20-inches tall, she is the biggest value in the doll line! Modeled curly hair is painted to look real. She has go-to-sleep eyes. Her chubby arms and legs are curved and dimpled and inside jointed (the better way). She is clothed in a dainty lace trimmed organdy dress, silk ribbon tied bonnet, slip, rubber undies, white socks and shoes. Model # 49V3114 Sold for 95 cents in 1937. Such quality, daintiness and beauty is hard to match for under $2! beautiful long curl mohair wig, sewed on, not pasted. Go-to-sleep eyes and a crying voice. She wears a dainty printed ruffled organdy dress. She has a double ruffle organdy bonnet, with a tied ribbon. She comes with white undies, socks and shoes. her long, graceful legs and inside jointed arms are composition. Model # 49V3016 Sold for 95 cents in 1937. There were also smaller dolls that cost less. There were also 14 1/2 inch composition dolls that girls could buy for 49 cents. There were even smaller, 9 1/2 inch baby dolls that you could buy for 25 cents. It was common back then to call African American dolls “Topsy Dolls.” They were sold to girls right alongside the Caucasian dolls. Regular $3.00 value! For $1.98! All composition, 27 inches tall, big, lovely, standing, well dressed at a new low price. She’s wearing an Organdy dress with organdy pointed collar, elastic puffed sleeves and matching bonnet. Complete with undies, cotton socks, tied imitation leather, buckle shoes. Wistful, long lashes. She has a mohair wig (but unfortunately it couldn’t be combed or brushed) and slim legs. Or how about a different doll? This one wasn’t just one of the usual “25 or 26-inch” or “Big as a 6-month baby” dolls with extra long, out of proportion bodies and too small head, arms and legs. She really is 26-inches tall and properly proportioned She had big, appealing, sleeping eyes with long, real lashes and can also cry! Her skin is double sprayed and expertly flesh tinted to give it that perfect human finish. The perfect baby face has her mouth open just enough to tiny p early teeth that glisten and a little pink tongue. She can turn her head, hold up her full-length arms because they are inside jointed. She was dressed in a lovely full cut, ruffled organdy dress, trimmed with the finest quality lace, with lace trimmed bonnet to match. Model # 79V3150 sold for $1.98 in 1937. Then came the really expensive, premium dolls made by designers like Madame Alexander. These sold for between $2-5. 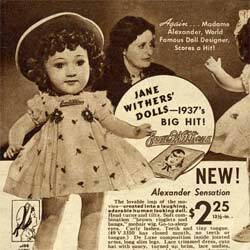 In the 1937, the lovable Jane Withers of the movies was created into a laughing, adorable human looking doll. She had brown ringlets and bangs in her mohair wig. She was a De Luxe model, composition inside jointed arms and long, slim legs. It came with gold plated name pin and a Jane Withers photo. There were four different models that ranged from 13 1/2-inches to 20-inches. Every little girl wanted a Dionne quint that could say “Mama” as well as sleep. Soft cotton stuffed babies made of hard to break composition. She also came with go-to-sleep eyes, curly dark brown hair, tied with a silk ribbon rosette and bandeau. Gold plated name pin and Quint booklet. There were five varieties: Yvonne, Marie, Cecile, Emilie and Annette. Obviously some of the most popular dolls in the 1930s were Shirley Temple dolls. We’re not really going to cover them here because they are going to get their own page. But while we’re on the subject, we can’t forget about the Paratex Sally Jane doll. She won’t break! She’s hard rubber (Paratex) which manufacturers claimed wouldn’t crack, chip or peel. She also came with a real human hair wig. She came in two sizes: the 15-inch model and the 19-inch model.